JAKARTA is a city of some ten million inhabitants. Like many other major Asian capitals, Jakarta is a polyglot of ethnic groups that all contribute to making up the city’s collective culture. The history and culture of Jakarta has many elements of India, Arabia, other parts of Asia, and the colonial powers of Europe, interwined with its own. Jakarta has more than its share of diverse ethnic influences as it is also the capital of a nation with over 17,000 islands and 300 cultural groups, many of which speak their own language as well as the national language, Bahasa Indonesia. As the prime gateway to Indonesia, Jakarta offers the culture of various regions and groups in the archipelago, in line with the national motto “Bhinneka Tunggal Ika” or Unity in Diversity. 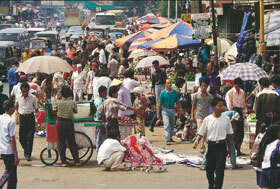 The city’s dominant populations come from the surroundings areas of Java, many parts of Sumatra, Bali, and Sulawesi. Also making themselves known area those hailing from Irian Jaya, Indonesia’s most eastern province, and Kalimantan, home of the Dayak and one of the largest rainforest in the world. Over the centuries, these groups have kept their cultural roots, yet some have also intermixed, including with non-Indonesians, to form a special group in their own known as Orang Betawi. Above all its mix of races and cultures probably still the most dominant in Jakarta is that of central Java, the source of art, music and dance – albeit Indian influenced – that represents much of what little most outsiders know of Indonesia. An important example is the highly stylized wayang. Jakarta is the port of entry for many tourists and business people. It is home to a dynamic contrast between Western-style skyscrapers, modern urban life-styles and traditional Indonesian culture. Its rapid growth into a metropolitan city reflects the economic, political, social and industrial development of the nation. In recent years, Jakarta has expanded its facilities for visitors with luxury hotels, fine restaurants, exciting nightlife and modern shopping centers. It contains many tourist attractions such as Taman Mini Indonesia Indah (Beautiful ‘Indonesia in Miniature’ Park), restored colonial period buildings, island resorts in the Pula Seribu (Thousand Island), and an extensive beach recreation complex called Ancol Dreamland.